Over the last century, thousands of jazz recordings have assumed their rightful place as classics of the American musical canon. But just as many extraordinary sessions have fallen by the wayside. Gems of Jazz is dedicated to bringing some of those forgotten recordings to light, offering digital versions taken from the shellac and vinyl originals. Six or seven years ago, I got a call at the radio station where I work. The caller wanted to know if I'd be interested in a bunch of old records that a relative had left her. She said they were jazz records. "What kind of jazz records?" I asked. "The kind that break," she said. "The real old kind. I don't think you can play them anymore." I said I'd come take a look. This sort of thing happens with some regularity. People know me as the jazz record guy at the station, and when they want to clean out those old records in the basement or attic, they call me. Occasionally I pick up some interesting sides, but usually it's a 35 pounds of mildewy Lester Lanin, Al Hirt, Martin Denny and Ping-Pong Percussion albums. Not that there's anything wrong with those, but I'm a jazz guy. So I usually make nice, offer many thanks and quietly donate their stuff to the local library book sale. In this lady's basement were three big, dusty cardboard boxes. In the boxes were probably 300 78 rpm discs. That's usually a bad sign – think Vic Damone, Patti Page, Kay Kyser, Mario Lanza. But the first shellac platter I pulled out was a Sonny Stitt on Roost. The next one was by Gil Melle, a 12-inch Blue Note, and the one after that was by Cyril Haines on red-label Comet. Who the hell was Cyril Haines? My palms were starting to sweat. It turned out that this lady's relative had been a disc jockey and entertainer in the '40s from somewhere out west. She wouldn't tell me much about him, but she said he was a jazz guy. I got the sense she didn't like him much and that's why she was getting rid of his stuff. A purge. And I was the beneficiary. When I got the boxes home – carefully! – I spent half a day going through them, marveling at what they contained. Here was a stack of Charlie Barnets on obscure labels like Derby and Abbey. An ultra-rare Floyd Smith, one of the first electric guitarists out of Kansas City. A Coleman Hawkins with Hawaiian guitar accompaniment. Johnny Hodges on Norgran. Even a Duke Ellington/Bing Crosby match-up! Crazy! But there was one set of discs that intrigued me. I saved them for last. 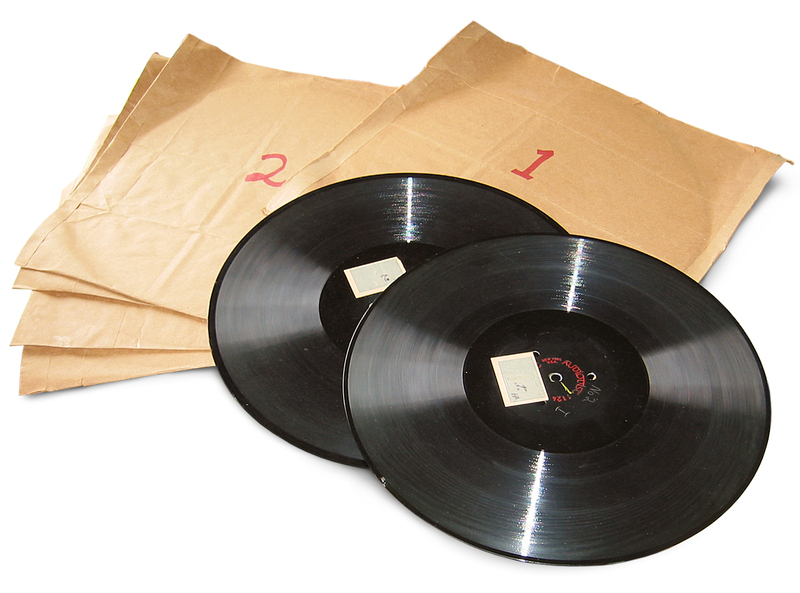 They were five big, 12-inch acetate records, the kind that were used back in the '40s for making one-off recordings. 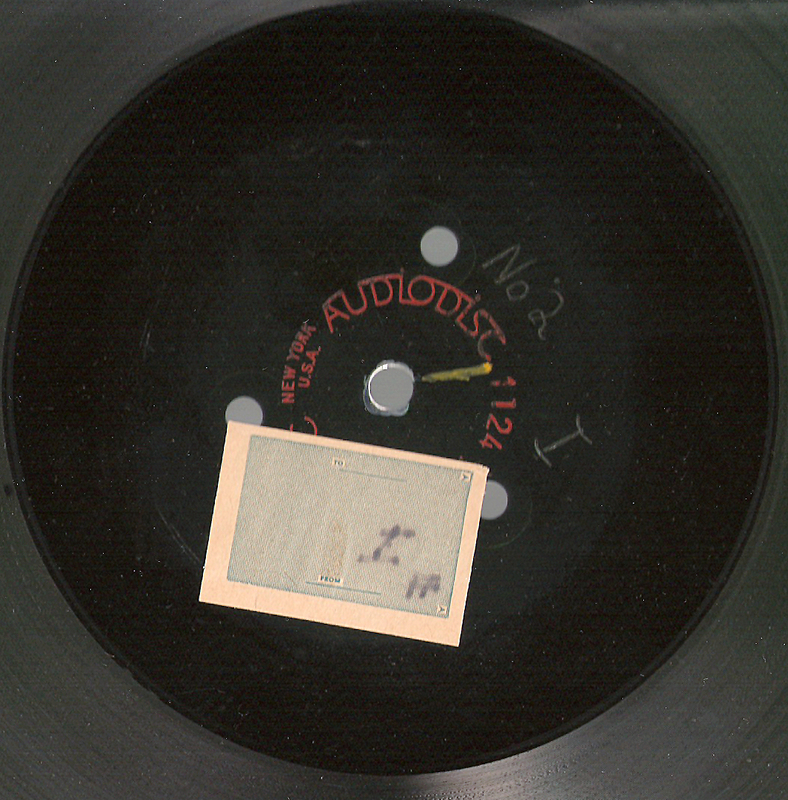 These discs were cut on both sides and had no information on them other than a number label – 1 through 5. They had been carefully kept in brown-paper envelopes that had been handmade by the previous owner. The platters were unnaturally cool to the touch. I put one on the turntable and dropped the needle. What came out of the speakers was the echo of a place and time gone sixty years. It was a radio broadcast – an aircheck. It turns out that these five discs captured in real time a 40-minute remote from a nightclub in downtown Chattanooga. The host/emcee was a fellow named Eddie Taliaferro – the very same gent the lady mentioned as I loaded her boxes into my car. They had been his records and now that was his voice. Shivers! Viola Wells (also known as Viola Underhill) worked as "Miss Rhapsody" for a decade from the mid-'30s to the mid-'40s. Photo from "Swing City: Newark Nightlife, 1925-50"
But why had he carefully preserved this broadcast? Perhaps because it had been an early brush with fame. 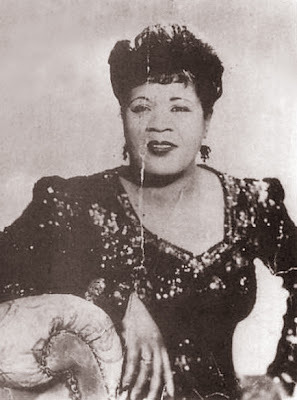 The featured performer for evening's floor show was blues singer Viola Wells – known professionally as "Miss Rhapsody." The date for the broadcast was probably spring or summer 1945, and Miss Rhapsody was a rising Savoy recording star. Her big number was "Hey, Lawdy Mama," and she was on a tour of the Southwest. Big-time New York talent had come to little old Chattanooga. Eddie dug her and wanted to save the moment. So what you hear in this offering is a previously unknown live performance by Miss Rhapsody, doing all her hits. 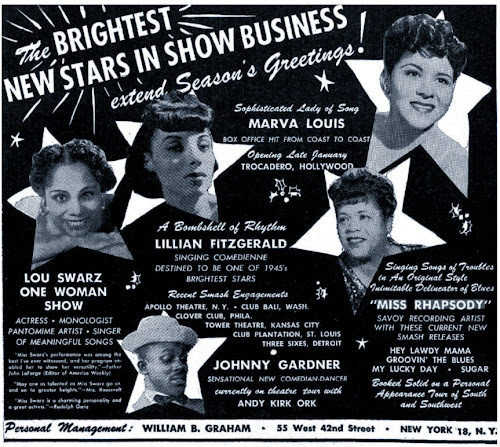 While she is obscure today, in her time she was a huge attraction at Harlem's Apollo Theater and one of the great female interpreters of jump blues working the TOBA circuit. But there's more. What you will also hear is what it was like to play a one-nighter in a tank town with a pick-up band and an all-night drive to the next gig waiting once the show was over. The Brown Derby, the club hosting the broadcast, was a joint in a funky part of Chattanooga habituated by gamblers, prostitutes and hustlers. The house band – the "Brown Derby Orchestra," Eddie calls them – flubs its way through the book, dishing up clams, dropped notes and bleats while suffering severe intonation problems. But Rhapsody rises to the occasion, carrying the boys along, unfazed. She's seen it all before – a real pro. You can't help but admire her. 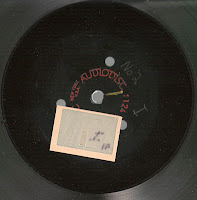 Also on the recording is a number by a member of the floor show – a "Miss Dodo." Not bad, and she could dance. And then there are the ads – including one for ladies' "lawn-jer-ee." Priceless artifacts of a bygone era. "Miss Dodo," v*; Eddie Taliaferro, emcee. Really amazing find - thanks very much, indeed !!! Your story of these sides, so remote as to be singular, one-of-a-kind, indeed, are what makes the web such a great place. A constant, 24-7 world party of history, mystery and moments, be they past artifacts like this, now lovingly shared by you, and snapshots of now, done by kids and eye-whitnesses world wide. Be it history now, or history then, this is the real testamony that some dictatorial regimes in the world today want to destroy, render fearful, exclude, or just ignore. It is as one torture victim of Eqyptian regimes said about his story of suffering and desire to make a free web society, "It is as if they are making war on a whole generation." You fight the good war, with happy jazz from a difficult past in the USA, who is not without guilt either, and in doing so, makes the world sense that free expression is a thing that now, with the web, and digital village communications, cannot be stifled, or destroyed, or beaten back into submission. Whoa, Den! You're getting pretty profound here. Yes, the web is a remarkable resource for things of cultural and intellectual merit, free -- or mostly free -- to all. But the ether is only as permanent as the next technological revolution. I first created a website back in 1989 with lots of info and images. But where is it now? Lost to the changes in the internet and to the software we use to populate it. In other words, grab these downloads now 'cause who knows how long they'll be available! The page just keep refreshing over and over again, any help? You don't know how great you make my days with this! Thank you so much gems! David Dann, host of Gems of Jazz, is the producer of "Blues Connotation," a 2-hour jazz and blues show heard Tuesday evenings from 8-10 p.m. EST over WJFF-FM, an NPR member station in New York's Catskills. In its jazz segment, the program features artists ranging from Louis Armstrong to John Zorn with occasional specials on jazz styles, labels, festivals, movements and other relevant topics. The blues portion covers acoustic and electric styles, showcasing everyone from Tampa Red and Bukka White to Johnny Littlejohn and Walter "Shakey" Horton. Dann also has a large archive of recorded jazz amassed over four decades of collecting, with nearly 7,500 LPs, 1,000 CDs and a sizable pile of 78s, 45s and tapes. He has supplied material to the Smithsonian and maintains a trove of jazz ephemera including posters, magazines, books and assorted miscellany. You can listen anytime to the latest edition of "Blues Connotation" by clicking the link below and scrolling down to the show in the Tuesday listings.